Reproduced with permission of Starship Foundation. Crying is how babies communicate - it does not mean your baby is being naughty. It may only take 1 or 2 hard shakes to seriously injure a small child. Shaken baby syndrome (SBS) is a combination of serious injuries that can occur when someone violently shakes an infant or young toddler. It is the single most preventable cause of serious head injury in babies under 1 year of age in New Zealand. It may only take 1 or 2 hard shakes to seriously injure a small child. This is because babies and toddlers have relatively big, heavy heads and weak neck muscles. When they are shaken, the brain slams back and forth inside the skull, resulting in bleeding around the brain and damage to the brain itself. Some babies may even stop breathing, which can cause further brain damage. The shaking can also cause bleeding into the back of the eyes. Many babies who are shaken also have broken ribs because they are held forcibly around the chest and squeezed when they are shaken. They may also suffer other broken bones during the shaking. SBS usually happens when a parent or other caregiver shakes a baby or toddler very hard because they are very frustrated with them. The number one reason given for shaking a baby is "I just wanted the baby to stop crying". Forceful shaking may stop the baby crying, because it causes a head injury. the section below - how can you prevent SBS? What are the consequences of shaking a baby? Every baby is different, so the symptoms may vary. Symptoms may include poor feeding, vomiting, irritability, fits (seizures), drowsiness, breathing problems and even coma or stopping breathing completely. Overall, in babies diagnosed with SBS, approximately 20 percent will die and 30 - 60 percent will suffer moderate to severe injuries. It helps to have a plan of what you will do if your baby keeps crying and you become upset or frustrated. SBS happens when parents or caregivers get frustrated with their baby or toddler, often in the case of babies because they are crying. What if my baby keeps crying? If you are worried that your baby is crying because they are unwell, see your doctor or after-hours medical centre. taking your baby for a walk in a front pack or stroller; you could also put your baby in their car seat and take them for a drive - motion generally helps to calm a baby down, and it’s good for you too! Take your baby to your nearest doctor straight away. Dial 111 within New Zealand for urgent medical help if your baby is unconscious or having breathing trouble. Use the appropriate emergency number in other countries. Don't let guilt or fear get in the way of your child's health. If your baby has a serious head injury because they have been shaken, it will only get worse without treatment. Early medical attention may save your baby's life and prevent serious long-term problems. If your baby seems quite well but is fussy and/or vomiting, it is important that you tell the doctor that you know or suspect your baby has been shaken, so that they can give the proper treatment. What can you do if you think you might hurt your baby? Put your baby in a safe place and leave the room. Give yourself a break and seek help. Where can you go to for help if you feel stressed? Check the directory for information and support - organisations, helplines, counselling services. 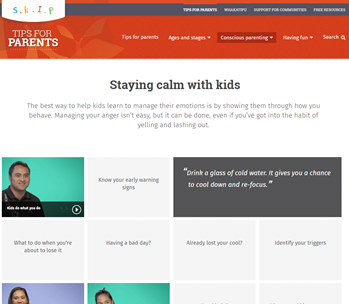 Check out Staying calm with kids at the SKIP (Strategies with kids/Information for parents) website. The video is reproduced here with the permission of Starship Foundation. Many thanks to Starship Foundation for funding the production of the DVD on which it is based. The period of 'PURPLE crying' refers to a time period when some babies begin crying more and may be hard to settle. This usually starts at about 2 weeks of age and peaks at 8 weeks. It usually ends by 12 weeks of age. The good news is that the period of PURPLE crying will end! 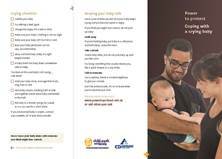 This resource, in English and Māori, is aimed at health professionals to use with parents and caregivers. It talks about the reasons why a baby may cry, gives tips for how to cope, and explains the damage that can be caused by shaking a baby. Everyone can read the information online and download a PDF copy. 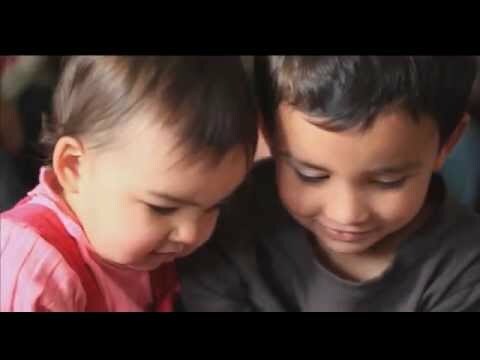 The coping with a crying baby video is based on an educational DVD which is a part of a shaken baby prevention programme aiming to educate caregivers on coping with a crying baby and the dangers of shaking a baby. Watch the video online on YouTube (click the image at right). Providers of health and welfare services can order copies of the DVD. Read about this at the HealthEd website. Barnardos works within the community to provide a range of care, education, information and support services for children and their families. Services include family counselling and family support, a one-to-one service developed for families under stress. Call 0800 BARNARDOS (0800 227627367). 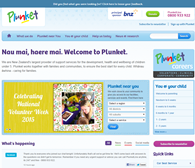 Child Matters is a registered charitable trust dedicated to preventing harm to children in New Zealand. Child Matters provides the following services, aimed at safeguarding children and helping in early detection and intervention when children are at risk or are being abused: training programmes (NZQA approved); seminars; workshops; advice, resources and handbooks. Training and professional development programmes are held throughout New Zealand. Parentline deals with children who have been sexually, physically or emotionally abused or who are at risk of abuse. Parentline acts as a child advocacy service. You can contact your local Citizen’s Advice Bureau for details of local crisis counselling services, as these differ from centre to centre. See the Citizen’s Advice Bureau website for a CAB near you. Call free on 0800 FOR CAB (0800 367 222). A website designed to be helpful to parents and professionals looking for information, ideas and answers to questions about shaken baby syndrome. This page last reviewed 19 April 2017.